Agra is only 4 hours away from Delhi and one day trip will give you chance to see famous Taj Mahal. We are discussing about the Agra/Taj Mahal one day tour package from Delhi and highlight you the details of palaces which can be covered in one day. Taj Mahal is one of the Seven Wonders of the World and one of UNESCO world heritage site India. Around 7-8 million visitors comes to Agra to see this famous marvelous building every year. The Taj Mahal is famous for its architectural beauty and its one of the UNESCO World Heritage in India. One day travel package from Delhi to Agra will give you a chance to see the famous tourist attractions in Agra. There are several travel packages from which you can choose the best suited package for your travel need. One day tour to Agra is very popular among Indians and foreign tourist because it enables them to see many tourist attractions in just one day. If you are able to increase your travel to one more day (total 2 days) then Mathura tours can be included in the package which will give a change to see the tourist attractions in Mathura/Vrindavan. We will talk about 2 days travel packages to Agra, Mathura and Vrindavan in some other post. 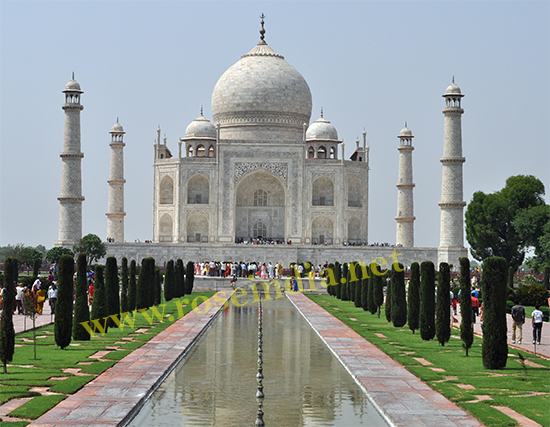 Let's see more details about the Agra one day travel package from Delhi. One day travel package start from Delhi early in morning around 5-6 AM. Our driver will pickup you from your hotel between 5-6 AM as per the travel plan fix with our representative. Pickup from Delhi: 5-6 AM. Our team will finalize the travel timing one day before the travel date. Our driver will pickup you at around 6 AM from your hotel/home. Distance of Agra from Delhi is around 240 KMs and it will take around 4 hours to reach there. 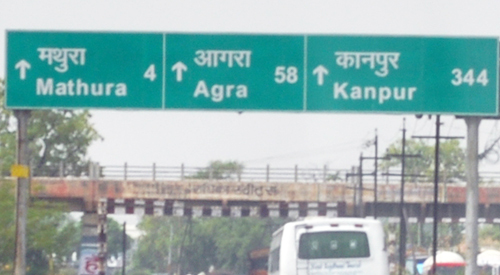 You will travel to Agra through Yamuna Express way. You can my stop for morning tea break around 8:30 AM at any food plaza at Yamuna Express way. After tea break proceed to Agra at 9AM. You will reach Taj Mahal around 9:30 AM. You can spend your valuable time in viewing the architectural beauty of Taj Mahal. Taj Mahal is built using white marble and it is situated on the bank of Yamuna in Agra. 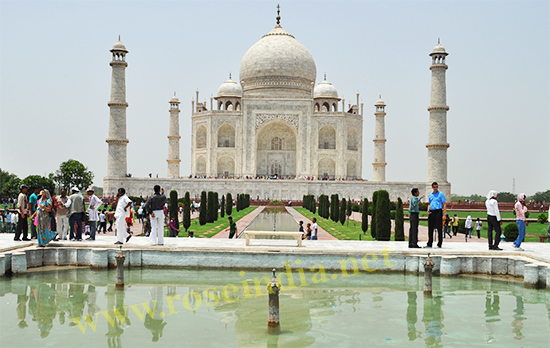 Taj Mahal spreads in 42 acres of land and there are beautiful garden in the Taj Mahal area. The Taj Mahal earned the status of UNESCO World Heritage Site in 1983. Millions of people visit Taj Mahal every year from India and abroad. Every year 7-8 million people visits Taj Mahal and the number are increasing. If you calculate the number of people visit per day then it comes around 20,000 people per day. This number is very huge and it's a feeling that you are visiting to see such a famous tourist place. You can spend around 2-3 hours in Taj Mahal and see its beauty. You can take you still camera by paying a fee at gate. Video camera is not allowed after first entrance gate in Taj Mahal. Still camera is also not allowed in the main tomb of Taj Mahal. Camera bags, extra battery are also not allowed, so you should keep your camera bags and extra battery in car or in hotel. Eatables and weapons are also not allowed inside Taj Mahal, visits have to pass through the tight security checking. After viewing the Taj Mahal you can go for local shopping in the nearby shops around Taj Mahal. After coming of the Taj Mahal you will find many shops for buying gift items. You will guided for your shopping in the nearby shops around Taj Mahal. You will many interesting gifts items which you can buy as a memory to your visit to Taj Mahal. You can may also buy gift items for your family members and friends. 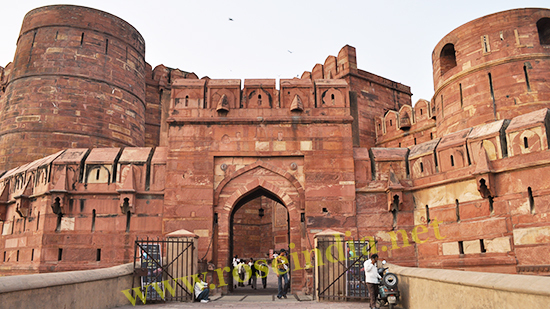 Now you will proceed to Agra Fort which is famous as another tourist place there. 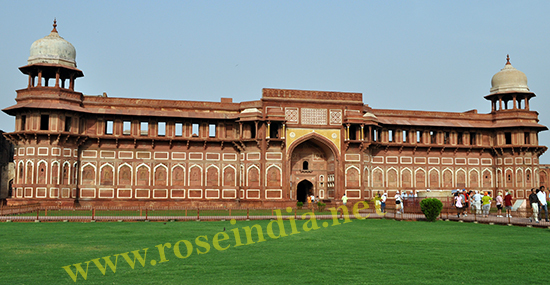 Agra Fort was built by Emperor Akabar in 1565 A.D. In Agra Fort you will see Moti Masjid, Musanman Burj and its building. Agra Fort is also a UNESCO World Heritage site, this fort is situated about 2.5 km northwest of famous Taj Mahal. During Mughal Dynasty Yamuna river was flowing near Agra Fort, but now it's away from Fort. 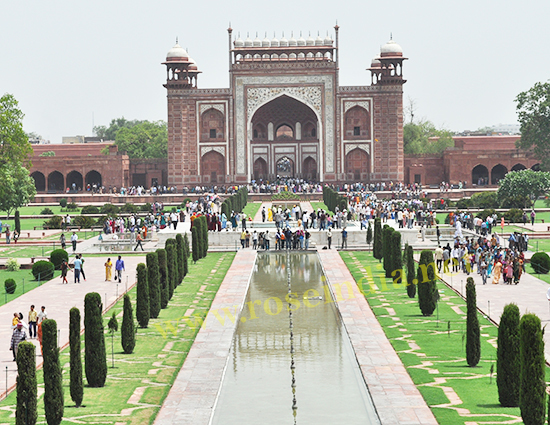 You can spend around 1 hours in Agra Fort and after that go for Lunch in any good restaurant in the city. Now it's time to go for lunch in any good restaurant in the city, our driver will guide you to find the best restaurant. Finally we will proceed to the Sikandara Tomb, which is at a distance of 10 kms from Agra Fort. Sikandara Tomb is the mausoleum of Emperor Akbar. This structure borrowed the architecture styles from Hindu, Christian, Islamic, Buddhist and Jain architecture styles. Now its time conclude journey with sweat memory, we will proceed back to Delhi through Yamuna Expressway. For some refreshment in a road side food shop we will stop there for around 30 minutes. You can take tea, coffee and items of you interest at food plaza. After refreshment we will proceed back to Delhi. Here your journey sweat and memorable journey to Taj Mahal concludes. Our driver will drop you at your Hotel or Airport.